If you’re reading this, then you’re using our new website! An upgraded shopping experience, offering a clearer process, courier delivery on all 6+ orders, multi-currency options, and detailed shipping rates worldwide. New, simpler interaction with our archive of articles and videos. 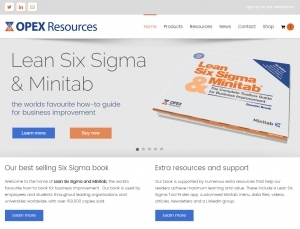 Easier-to-find support tools such as our free Minitab menu and example data files. A new ‘flipbook’ to view samples of our book online. We hope you like it! And if you have any feedback please let us know!